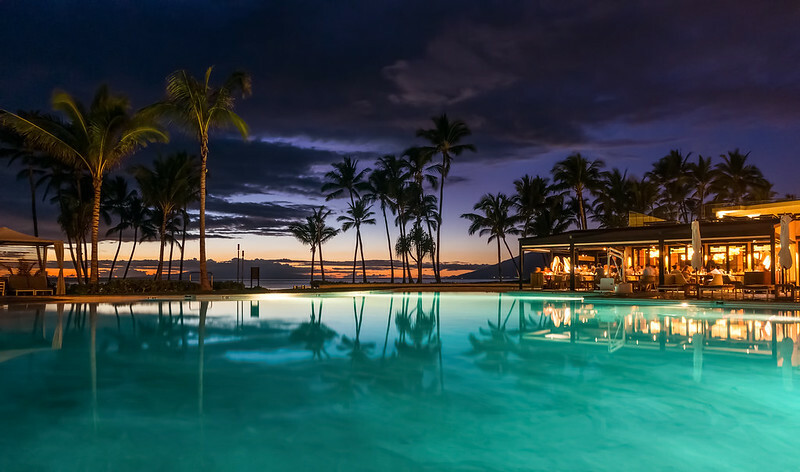 Blue Hour At The Andaz Maui | Flights. Camera. Satisfaction. This looks so good. What camera settings did you use? Thanks Amy. I think I may have spent too long zoomed in clearing up the noise to appreciate the full picture! That is beautiful ~ great time of the day! Thanks Dalo, this is fast becoming my favourite time of day. Its fascinating to watch a place transition from light to dark! I agree fully. There seems to so much more mood & ambiance that happens in the blue hour ~ Cheers and safe travels! Ben, granted I’m viewing your picture on my iPad, but had you not mentioned the noise, I would never have guessed you had an issue with it. So you clearly did something right with Topaz and Lightroom! This is an exceptionally clear photo and the colors are stunning – the purple with the turquoise is exquisite, made all the better by the reflections. What an amazing trip you had! Thanks for share it with us! Hey Ben, nice capture! I don’t think it looks at all processed. Thank you 🙂 Thats good to know, removing noise can be such a tricky process!